Since spinach or any green leafy vegetable is a favorite at my home, we have it at least a couple of times in a week, and now after coming to India, we get so many varieties too. Today's dish is a simple saute, though I have called it 'Spinach Saute', I have used Amaranth leaves (Mulai Keerai in Tamil) that you can also get in the US. It's a nice side dish with rice or rotis, not very spicy and needs very few ingredients..
Wash and soak the tuvar dal for an hour, clean the amaranth leaves by removing the hard stems at the end, wash and chop, comes to about 2 cups packed. Heat some oil, add the urad dal, mustard and cumin seeds, when it starts spluttering add the asafoetida and the dry chillies, followed by the amaranth leaves and the tuvar dal. Add some salt, cover and cook till the greens is done and the tuvar dal is soft when you pinch it with your fingers. Lastly add the grated coconut, mix and serve warm. The liquid from the greens is enough to cook the dal, if needed sprinkle some water, stir it in between. You can add a couple of crushed garlic for flavor and leave out the asafoetida. Adding coconut at the end is optional, add it if you like coconut. Can use regular spinach also instead of amaranth leaves, or any greens that doesn't become very mushy when cooked. You can add red chilli flakes instead of the dried red chillies. 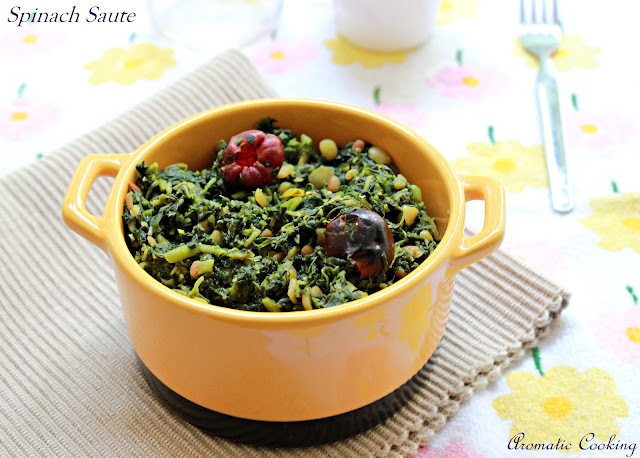 Healthy and delicious spinach saute.. Spinach saute looks Great !!! Great way of doing spinach. Healthy and yummy dish. i too love to add Tuvar dal to my spinach poriyal...looks yumm!! Nice one Hema, I have to try with toor dal. Very yumm & delicious spinach poriyal !! I want to eat all of it in the bowl - so green and delicious looking dear!!!! 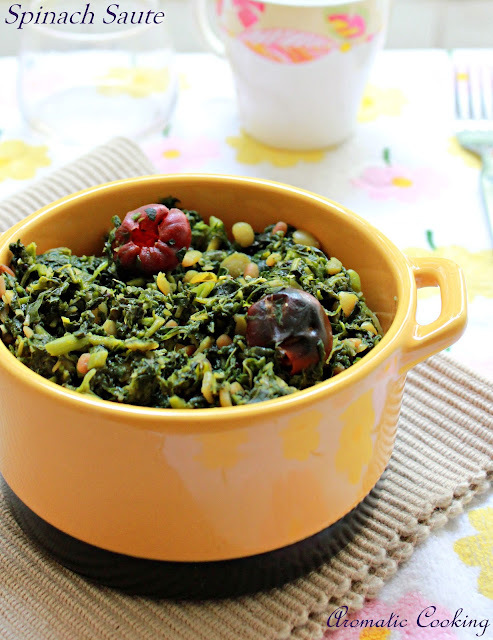 Healthy spinach recipe with dal! Looks yum! Sounds very healthy n yummy! Would like to give it a try soon! Yummy and healthy.I too make it with dal.But with slight difference.Nice clicks . Looking at some of your posts while we are traveling is pure torture. I just would love an home cooked meal at this point. what is amarnath leaves hema. i keep hearing this term but cant make out what it is. Very healthy recipe,me too make this same way.. Delicious I make most of time. I love spinach and rice...this looks perfect!! i always like keerai porial.. lovely preparation..